Ideal for using up any old mushy black bananas! Sultanas if liked or other fruit. In a bowl cream together the sugar and butter. Use an electric whisk and beat in one egg. Put in bananas and whisk again. Put in flour, allspice and salt and whisk. Add sultanas or fruit and fold in. Tip into a loaf tin (with a liner to make it easier), sprinkle top with little sugar. Bake for aprox 40 mins or until skewer comes out clean. Scrummy yummy! Nice warm with a bit of butter on or cold. Very moist and keeps for days (if not gobbled up all in one day!). Great for all non-cooks as you can put it all in the bowl and mix up. 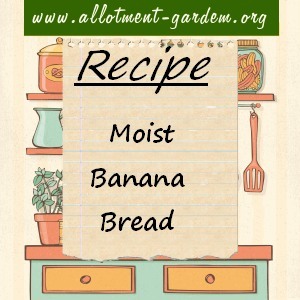 Hardly any washing up do after making this banana bread too! Interested to see two recipes for banana nread. what would you say the difference between banana bread and banana loaf? This would help settle a discussion from our local agricultural shows baking tent. this recipe is fabulous so easy,never made it till a few weeks ago now carnt keep up with the demand for it from my family.I put sugar with cinnamon on top before baking it.thanks again from nana gail just shows you can learn new things every day no matter how old you are.